It's Not Too Late to Qualify for the 2013 Washington International Horse Show Championships! WASHINGTON – July 31, 2013 – As competition heats up around the country this summer, the Washington International Horse Show (WIHS) would like to remind competitors that there are still many opportunities for horses and riders to earn points for the 2013 year-end championships. The WIHS qualifying period runs from shows starting on or after Sept. 1, 2012, through shows starting on or before Aug. 31, 2013. Don’t miss the chance to compete at one of the nation’s most celebrated horse shows! As the country's only metropolitan indoor horse show, the Washington International Horse Show hosts one week of world-class competition each year at Verizon Center in downtown Washington, D.C. This year’s competition, which includes six WIHS championship finals in the hunter, jumper, and equitation divisions, will be held on Oct. 22-27, 2013. Championships include the $10,000 WIHS Children's Hunter, $10,000 WIHS Adult Hunter, $10,000 WIHS Children's Jumper, $10,000 WIHS Adult Jumper, as well as the Hermès WIHS Equitation Finals and WIHS Pony Equitation Finals for junior riders. WIHS competitions are open to all who wish to compete, however points acquired only count for current WIHS members. Sign up today to become a WIHS member and start earning points toward the WIHS championship finals at Verizon Center. In the WIHS Children’s and Adult Hunter and Jumper Championships, 30 horse and rider combinations will be invited to compete in each division based on points earned during the qualifying period. In addition, the children’s and adult hunter and jumper champions at the 2013 WIHS Regional Horse Show held on Oct. 18-20, 2013, at Prince George’s Equestrian Center in Upper Marlboro, Md., will automatically qualify. As of July 19, 2013, rider Mindy Wurzburg of Memphis, Tenn., and her mount Overseas, are well in the lead for the Adult Hunter Championship standings with 2,788 points. Fellow Tennessee native, and Wurzberg’s sister, Cheryl Rubenstein and her horse Riesling stand in second place with 1,694 points. From Virginia, last year’s championship winners Amy Zettler and Glad Rags sit third in the standings with 1,680 points. Zettler looks forward to returning to Verizon Center to compete again this year with Glad Rags, who she has had for four years now. 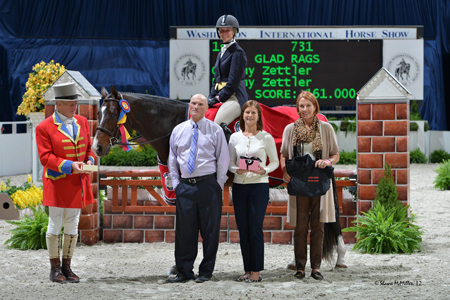 As a WIHS member, Zettler enjoys competing throughout the year to earn points toward the year-end championship and loves the camaraderie between all of the riders. In the Children’s Hunter Championship standings, Mary Claire Medeiros of Chevy Chase, Md., and her mount Olivia are in the lead with 2,658 points. The pair finished fourth in the 2012 championships and will attempt to improve on that placing this year. Mallory Hensley of Yukon, Okla., and Van Gough are in second place with 2,184 points with Lindsey Bland of Gloucester, Va., and Tribute sitting in third with 2,026 points. In the Adult Jumper Championship standings, WIHS President Victoria Lowell of Brookeville, Md., and Tippitoo hold a solid lead with 3,444 points. Boston-based rider Alexandra Cherubini and EquiFit Carlos sit second with 3,057 points, and Phoenix Cooke, of Chardon, Ohio, has 3,051 points in third with Sky’s Burnin’ Blue. The Children’s Jumper Championship standings are led by Kimberle Paige Burton of Huntersville, N.C., with 2,852 points riding Kolette. From Wayne, Ill., Giavanna Rinaldi and Juliette have 2,851 points in second. Andre Mershad, of New Albany, Ohio, sits in third with 2,599 points aboard Opera. Two of the biggest highlights at WIHS each year for junior riders are the exciting Hermès WIHS Equitation Finals and WIHS Pony Equitation Finals. Riders compete throughout the year to earn a spot in the finals, and these classes have been a proving ground for future grand prix and Olympic riders. In the feature Hermès WIHS Equitation Finals, 40 riders will be invited to compete based on points earned in WIHS Equitation classes held year round throughout the country. Thirty riders will be invited from the East Coast League and 10 from the West Coast League. Twenty-five riders will be invited to compete in the Pony Equitation Finals. Talented rider Victoria Colvin, of Loxahatchee, Fla., currently has a firm grasp on the top spot of the East Coast WIHS Equitation standings with an impressive 6,578 points. Colvin placed sixth in last year’s final and has won multiple qualifying classes around the country this year on her journey back to Verizon Center in 2013. Ashton Alexander of Ocala, Fla., sits second with 4,700 points and Charlotte Jacobs of East Aurora, N.Y., is third with 4,678 points. On the West Coast, Sydney Callaway of San Diego, Calif., holds the lead with 2,664 points. Alexis Graves of Coto de Caza, Calif., has 2,392 points in second, and Taylor Sutton of Austin, Texas, sits third with 2,324 points. For the Pony Equitation Finals, Haley Redifer of Barboursville, Va., leads the way with 865 points. Coco Fath of Fairfield, Conn., has 861.5 points in second place, and Bernadette Chungunco of Fairfax, Va., sits third with 818 points. It’s not too late to qualify for the championships at this year’s Washington International Horse Show. The team at WIHS looks forward to hosting many extraordinary talents from around the nation in 2013 and encourages all riders to continue their drive to qualify. 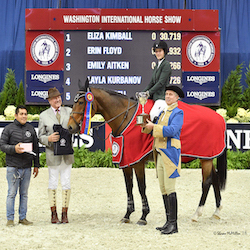 The official prize list for 2013 Washington International Horse Show is now available online at http://www.wihs.org/prize-list/, featuring some exciting new changes to the schedule and to prize money. Entries close on Sept. 3, 2013.